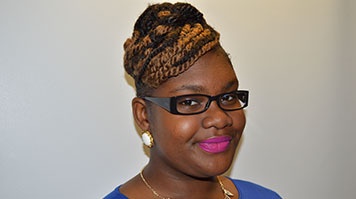 After studying for a BTEC locally at Lambeth College, Yasmin had applied for another university but just had 'a feeling' that London South Bank University (LSBU) was right for her and changed her plan completely. Her mum studied at the National Bakery School here, but Yasmin's interests lie very much elsewhere. Interested in gadgets and computers ("I was always the one fixing the house wifi and computer," she said), she decided on a BEng in Electrical and Electronic Engineering. I like using my hands and I didn't want to do the stereotypical courses, I wanted to break that barrier and do something I'm really interested in. So far her course has been tough, but Yasmin has met the challenge by giving her all and spending a lot of time in the library. She says the highlight of her course so far has been achieving her first 'first' in a Maths assignment. "I realised I wasn't putting enough effort into my Maths," she said, "So in semester two in my first year I decided to focus on it and it paid off. I got 80% in my assignment. I was so happy, over the moon. It gave a real boost to my confidence and my grades have been improving since. "The course is a BEng so I'm learning a lot of theory. It's hard, but interesting and I've had good support from my lecturers." The computer labs are where Yasmin spends a lot of her time, using LSBU's industry standard MATLAB, Math Cad and Lab View programmes. "Coming here and learning how to programme is really good because I know that when I go into work I'll be programming, these skills are vital in the computer age that we're in now." Yasmin is also hoping to complete her sandwich year in industry next year. The best thing about LSBU is the people – my classmates are great and the lecturers are all approachable and knowledgeable. In the future Yasmin hopes to start her own business, particularly in the electrical side of engineering. She's keen for more women to enter the profession and encourages future students to "attend, focus, study for all your tutorials and aim high".